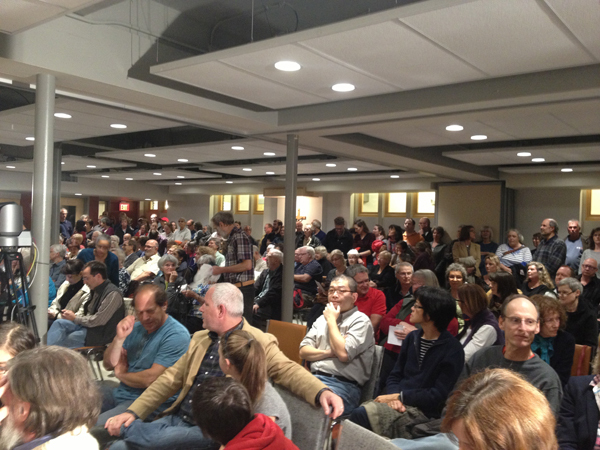 It was standing room only at the Oct.6 all-candidates’ meeting at St.George’s Parish. The capacity crowd resulted in people standing outside the windows looking in. Many Kitchissippi residents fear that extending light-rail transit and bringing in more people into their ward will mean bulldozing trees, building tall towers, and jamming a major street with thousands of OC Transpo buses. Residents like Cheryl Parrott see extensive development as the biggest issue facing the ward in the run up to the 2014 municipal election. Parrott is particularly worried about the city’s plan to divert 2,500 buses a day onto Scott Street, near her home, during the rail construction starting in 2016. She suspects the solution will not only slow down service for commuters but also increase noise levels and push impatient drivers to side streets. “Can you just imagine that many buses a day 15 feet from your bedroom window?” she asked, frustrated that the city resists looking into other rerouting options to avoid a bottleneck cutting through her ward, just west of downtown. Parrott is also concerned that some of the many new condos being put up in the ward are not selling out while other properties purchased by developers are left run down with shattered windows and tagged walls. Residents’ concerns over traffic and development were loud and clear at all three all-candidate debates, including the final event on Oct. 6 that filled St. George’s Parish, where incumbent Katherine Hobbs continued to defend herself from accusations of siding with developers on divisive projects. “Every condo that’s now being built did not come before me for approval. Those were all approved developments before I came on council four years ago,” said Hobbs in an interview. Hobbs has been dealing with a residual issue left over from the 2010 election. Corporations, including property developers and managers including Uniform Commercial Developments and Osgoode Properties, financed 35 per cent of that campaign. She is being challenged in the ward by former Hintonburg Community Association president Jeff Leiper, consultant Michelle Reimer, community activist Ellen Lougheed, and retired registered nurse Larry Wasslen. Leiper has pledged that he would not accept campaign funding from developers or individuals with strong ties to the development industry, while Reimer wants to push this even further by forbidding candidates from accepting union and corporate donations. Earlier this year, Coun. Hobbs took the community’s side in supporting a 12-storey condo complex at Wellington Street West and Island Park Drive, a building which would have been three storeys higher than allowed by the community design plan. “The neighbourhood that was immediately there asked me to be in support. Very unpopular thing to do in an election year,” she said about the project, which was ultimately turned down by the city’s planning department and council in May. Kitchissippi residents are also concerned about developers seemingly having free reign over their community’s older trees. A loophole enables developers with building permits to cut down trees and sidestep landowners’ requirement to obtain a “distinctive tree permit” to remove trees that are more than 50 centimetres in diameter. Hobbs says she would continue to work on closing the loophole. She mentioned Ottawa is currently entering its trees into a database, which will be considered when issuing building permits. Reimer has criticized how the ward’s development proceeds are funneled into public art and mini-parks, successfully supported by Hobbs at council, before other presumably more important concerns such as safety and infrastructure. For his part, Leiper proposed bringing back a ward council—which can be best compared to town hall—to give constituents a say before decisions are made, which he thinks would pair well with mayor Jim Watson’s shovels-in-the-ground approach, as seen with the LRT project. “The only time the community really gets together with the councillor right now is when something awful has been proposed, and it’s always a battle,” said Leiper, who instead wants quarterly meetings with residents and community stakeholders. On the development issue, Lougheed pushes for more accessibility and affordability. Wasslen, who ran as Ottawa Centre’s communist candidate in the last provincial election in June, only attended the Oct.6 all-candidate’s debate. His platform also includes affordable housing as a top priority.